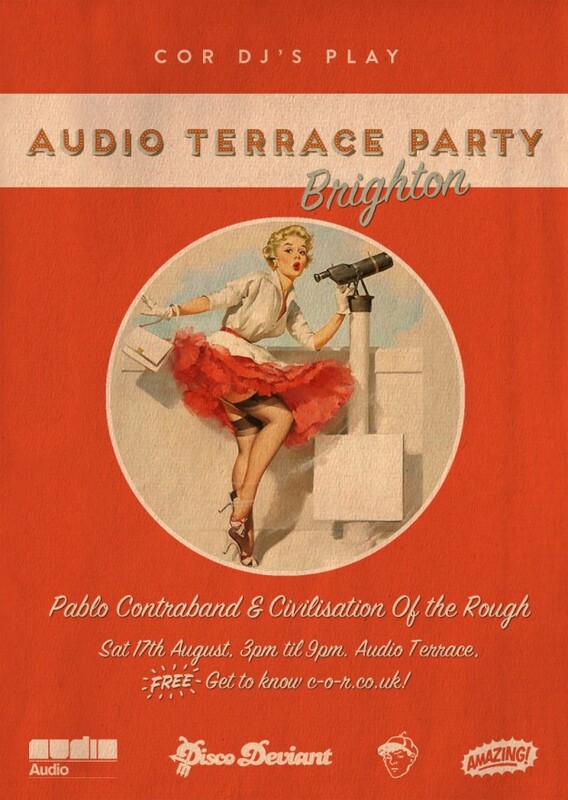 COR DJs at Audio Summer Terrace Party!! Brighton!! ROAD TRIP! ROAD TRIP!!! The COR DJs have kindly been invited back to the wonderful Above Audio to play at one of Disco Deviant’s awesome Summer Terrace Parties!! Thanks Pablo!! We did this last year and had a brilliant time, made even better by the swathe of smiley Southsea COR faces who made their way up on the train to support the disco cause. What a day!! So, hoping for much more of the same this year. Expect a balearic back to back session from the COR fam that will no doubt quickly escalate into the many bangers that didn’t get sufficient airing at Farm Fest! VERY much looking forward to this. As is customary with our COR Road Trips, we throw out an open invite to any and all who might like to travel up with us on our out-of-town disco adventure. The party kicks off at 3pm on Sat 17th Aug, so the plan as it stands is meet at Fratton Station to catch the 11:29am to Brighton. Once there find somewhere nice to haul up and grab a swift half before heading to Audio. Disco shape throwing and lots of rum, coke, house music, bants, shants and general funtimes will then of course ensue. We finish up the terrace party at 9pm, thank our wonderful host for having us, say our goodbyes to the wonderful city that is Brighton and catch the last train home to Pomps just after 10pm. Then prob a little carry-on back in Southsea for those who can still stand/speak. Oh yes, VERY excited about this little day trip. So much fun last year. Please get to know https://www.facebook.com/events/415572011897302 and most certainly GET INVOLVED!! It’s gonna be a gooden.